Woodbridge sophomore Madison Lyon received more than 13,000 votes, the most of any athlete in our class-by-class polls. Lyon out-polled Long Beach Wilson sophomore Rachel Glenn by 1,526 votes. We asked for your participation in our track & field season year-ender polls and you voted to the tune of 92,686 total votes across four grade-specific classes and eight gender-specific polls! We thank you for your participation! As noted above in the photo caption, Woodbridge (SS) sophomore jumper/hurdler Madison Lyon was the the top vote-getter in the state. Lyon received 13,152 votes, 47.2 percent of the 27,865 votes in the Sophomore Girls Poll. 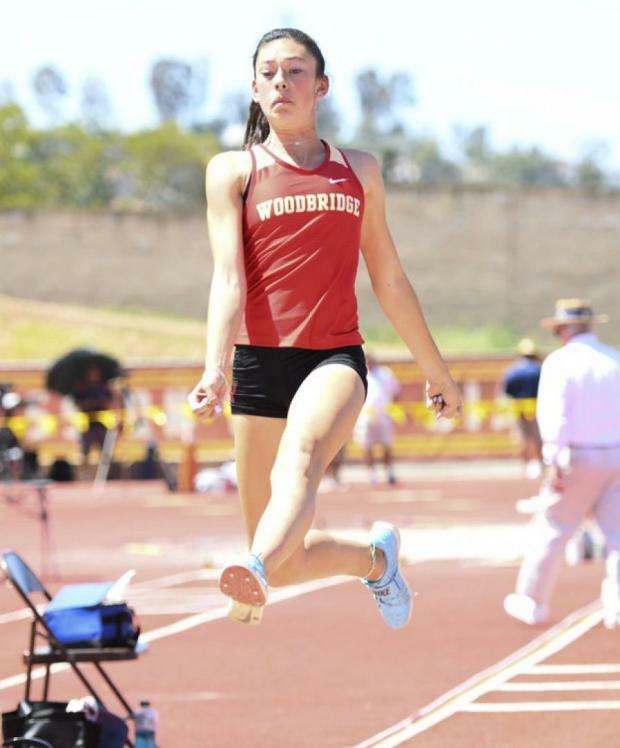 Rachel Glenn, the State Meet co-champion in the high jump from Long Beach Wilson, received 11,626 votes, 41.72 percent of the Sophomore Girls Poll total. How's that for awesome competition!! Way to go, voters!! The Sophomore Boys Poll was nearly as close. Upland (SS) sprinter/jumper Namir Hemphill was the winner with 10,254 votes, 47.26 percent of the 21,698 total votes cast in that poll. St. Mary's (SJ) hurdler Jamar Marshall was second with 9,463 votes (43.61 percent). Lyon, Glenn and Hemphill were the only athletes to receive at least 10,000 votes. Generally, the voting was fast and furious for the lower grades and tailed off significantly for the higher grades. Freshman Boys Poll winner James Wright, a thrower from Great Oak (SS) received the third most votes overall, 9,765, which was 52.8 percent of the 18,494 votes cast in that poll. Freshman Girls Poll winner Paige Sommers from Westlake (SS), the nation's #1 pole vaulter in the Class of 2021, received the third most votes among girls across all four polls, 7,897, which was 43.53 percent of the 18,141 votes cast in the Freshman Girls Poll. Jocelynn Budwig, the State Meet shot put champion from Fowler (CS) received a dominant 70.53 percent of the votes, well ahead of runner-up Jazmyne Frost the sprinter who led Serra (SS) to the State Meet girls team title. Frost received 27.36 percent of the votes in the Junior Girls poll. Caleb Roberson, the State Meet champion in the 300 hurdles from Upland (SS), received 69.19 percent of the votes, well out-pacing State Meet shot put champion Daniel Viveros of Liberty (CS), who has 15.17 percent of the vote. Jada Hicks, the State Meet champion in the 100 hurdles from Upland (SS), was a narrow winner over State Meet 300 hurdles champion Breanna Bernard-Joseph of Roosevelt (SS). Hicks received 38.88 percent of the vote. Bernard-Joseph got 34.93 percent. Because of limited voting in in senior polls, the difference here was 24 votes. Christian LaValle, the State Meet discus throw champion from Mission Viejo (SS), was a dominant winner receiving 68.31 percent of the vote. State Meet 800 meter champion Jason Gomez of Westmont (CC) was second with 11.48 percent of the vote.